What I love about Santorini is that you don’t need a plan. And the best moments always happen when you don’t plan. I may have been lucky to visit this beautiful island three times now, but each time has been completely different. Why? Because I didn’t plan; I simply set out each day and went with the flow. The best part is that it doesn’t matter where you are based because the Santorini caldera is extremely accessible. There are buses, taxis, quads and cars to hire everywhere. For this trip I was based in Fira, which was great because I hadn’t explored this side of the island. 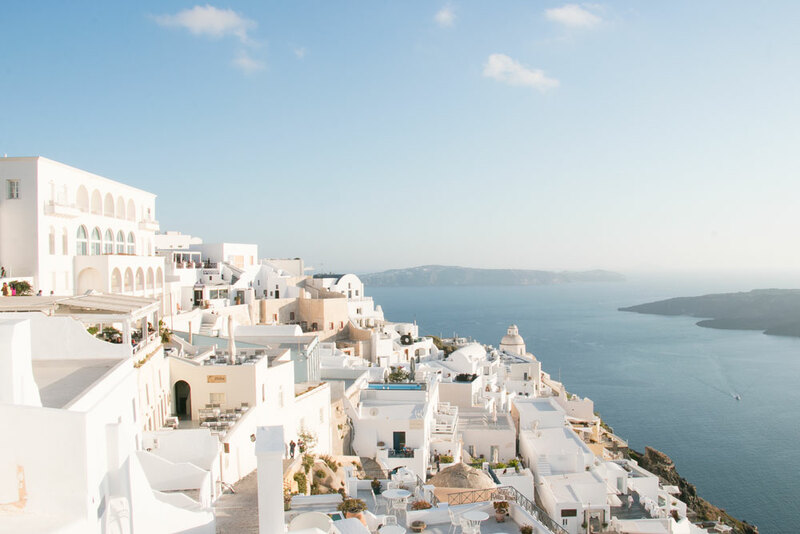 But if you do need a little advice on how to spend a day in Santorini by way of a casual itinerary, continue reading on. For first timers and seasoned Santorini vaycayer's, I highly recommend you start your day early in Oia before the crowds and (literally) thousands of people from the cruise ships arrive on the island (usually around 9am-10am). Take advantage of the quiet laneways and simply explore until you get lost, trust me. It’s the best way. Breakfast in Greece is really simple – fresh fluffy Greek yoghurt with fruit and of course baklava. For the best pistachio baklava on the island, you have to go to Skizma in Oia (it's located on the main street in town). Once you’ve grabbed a bite to eat, don’t stick to the main laneway of the village; walk down the myriad of stairs unknown because this is the best way to explore Oia. You can easily spend three hours exploring the laneways taking photos and pretending to live on the caldera. Time flies in Greece and you’ll no doubt work up an appetite after exploring for a few hours, so I recommend getting lunch at Thalina Taverna in Oia for the best tzazkiki, Greek salad and views. Opposite the restaurant is a great clothing shop called B.Loose which has some of the most beautiful Greek linen clothing I’ve ever laid my eyes on. I bought myself a pair of grey linen slacks, which ended up being perfect boating attire for my week long sailing trip from Santorini to Mykonos with G Adventures. From here I recommend catching a taxi over to Perissa, the black sand beach for a swim in the ocean and then make your way over to the Red Sand Beach, it’s one of the most famous and beautiful of the beaches of Santorini and is located near the village and ancient site of Akrotiri. When you get there walk past everyone on sunbeds and head over the cliffs for more privacy. Sadly I wasn't able to visit these beaches on this trip but they are incredible and totally worth the visit! When you’re ready to kick on, make your way over to Fira for some shopping, sunset and dinner. I absolutely loved Fira, it was so much quieter than Oia and had a calm atmosphere. The shopping is excellent and I ended up buying a little black dress to wear with sneakers. I highly recommend getting lost amongst the laneways and as the sun starts to fade, head to Rastoni for dinner. Get the octopus ink risotto; it’s to die for. Just make sure you arrive an hour before sunset so you can enjoy your meal with a glass of wine (or ten) as the sun starts to descend beyond the horizon.